Assistant Professor Matthew T. Pietryka won the Heinz I. Eulau Award from the American Political Science Association. Matthew T. Pietryka, Ph.D. (Political Science) won the Heinz I. Eulau Award from the American Political Science Association for his article “It’s Not Just What You Have, but Whom You Know: Networks, Social Proximity to Elites, and Voting in State and Local Elections,” published in American Political Science Review. The $750 award, supported by Cambridge University Press, recognizes the best article published in American Political Science Review and Perspectives on Politics. 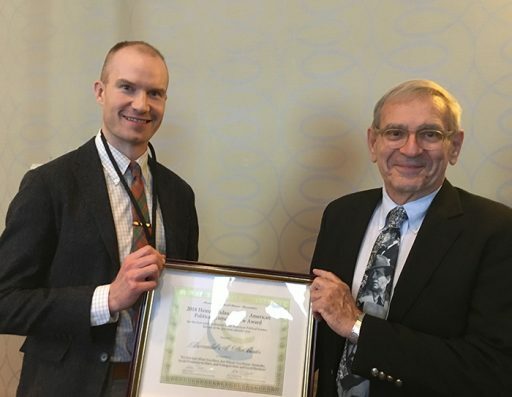 Pietryka received the award at the 2018 APSA Annual Meeting & Exhibition, the world’s largest gathering of political scientists. Amy L. Ai, Ph.D. (Social Work) published “Acculturation Factors Related to Obesity of Latino American Men Nationwide,” in the American Journal of Men’s Health. Ai also co-authored “Childhood Abuse, Religious Involvement, and Lifetime Substance Abuse Among Latina-Americans Nationwide,” published in the journal Substance Use and Misuse. Ai co-authored “Perceived Discrimination and Obesity of Latinas in the United States,” currently in press in Ethnicity and Health, an official journal of the UM Population Study Center Institute of Social Research. Jessica S. Bahorski, Ph.D. (Nursing) co-authored “Self-efficacy, Infant Feeding Practices, and Infant Weight Gain: An Integrative Review,” published in the Journal of Child Health Care. Randall Holcombe, Ph.D. (Economics) authored the book “Political Capitalism: How Economic and Political Power Is Made and Maintained,” published by Cambridge University Press. Adam A. Millsap, Ph.D. (Economics) authored the article “The Role of Economic Freedom in Intercity Competition: A Framework and Some Evidence from U.S. Metropolitan Areas,” published in the Journal of Regional Analysis & Policy. Gwen Welliver (Dance) premiered her most recent commissioned choreography “On its face” at Gibney in New York City. “On its face,” which was reviewed in Dance Europe Magazine’s July edition, arranges and re-arranges 2D and 3D materials, the detritus of a decade-long collaborative working relationship with performer Stuart Singer and composer Jake Meginsky. Ilana Goldman (Dance) served as co-director, editor, choreographer and solo performer in “InterState,” a short dance film. The film, which will soon be featured in WomenCinemakers Magazine, won the Jury Award at the St. Petersburg International Film Festival in Russia. It has been screened at the ScreenDance Festival Sweden in Stockholm; Braga International Video Dance Festival in Portugal; Benicia Film Festival in California; Jacksonville Dance Film Festival; and EnCore Dance on Film 2018 in Atlanta. The film will be screening soon at the Light Moves Festival of Screendance in Ireland; Thessaloniki Cinedance International Festival in Greece; and Sans Souci Festival of Dance Cinema in Colorado. Chris Cameron (MANCC), who has been documenting the creative process of MANCC’s artists in residencies since 2011, had his video documentation accepted to The Other Film Festival, the first and foremost disability film festival in Australia. Cameron’s documentation of Alice Sheppard’s fall 2017 residency to develop “DESCENT” will screen in November. Sally Karioth, Ph.D. (Nursing) presented “Finding Joy in What You Do” at the fall 2018 Welcome Back Symposium on the FSU Panama City Campus. Neil Abell, Ph.D. (Social Work) presented “Awareness, Acceptance & Action: Social Work Practice Education Challenges Delivering Services to ‘The Other’ Following the Troubles in Northern Ireland” to the International Federation of Social Workers and International Association of Schools of Social Work in Dublin, Ireland. Marianna Tutwiler, MPA, MSW (Florida Institute for Child Welfare) received legislative appropriation in July from the Office of State Courts Administrator to conduct a one-year statewide evaluation of Florida’s Early Childhood Courts (ECC). Caleb Mitchell (Dance) served as an invited faculty guest teacher and choreographer for the Charlotte Ballet Summer Ballet Intensive in June and July. Mark Horner, Ph.D. (Geography) has been appointed associate dean for research in the College of Social Sciences and Public Policy. Horner will lead efforts to expand the college’s sponsored research portfolio and to increase outside funding from government agencies, foundations and other sources. Stephanie James, MFA (Art) has been appointed chairperson of the FSU Department of Art.